Christmas is usually a happy occasion for everyone. It has always been the most anticipated time of the year celebrated at Sacred Heart Catholic School in New Smyrna Beach. However, last Christmas was entirely different. Our school lost a beloved former student and former employee in a car accident, Ms. Kaelee Morrell. Ms. Morrell was the type of person who always had a smile on her face, no matter how good or bad her day was going. Fellow staff member, Mrs. Buck remembered her saying, “She was sweet, kind, and bubbly. She was working in the office, helped with aftercare, and helped out with lunch duty.” She added, “The funeral was pretty sad… it was hard to attend.” Mrs. Buck is an example of how much everyone cared about Ms. Morrell. 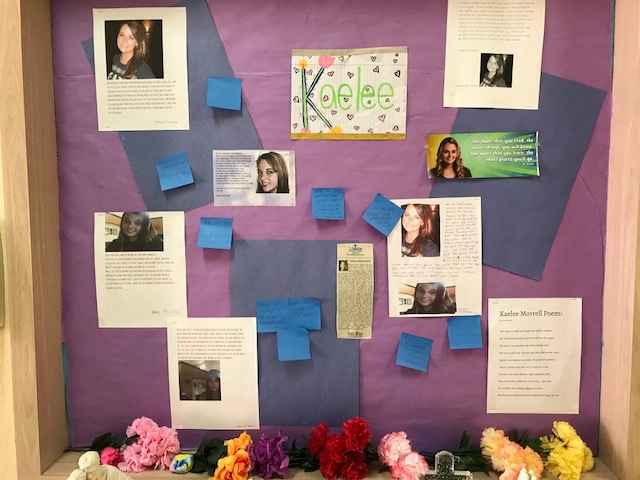 The teachers even made a wall of remembrance dedicated to her. The students wrote messages on sticky notes and posted them up on the wall. Sixth grade student, Avery, even wrote a poem and posted it on the wall. Avery and seventh-grader Madeline noted that the number of people who attended her funeral Mass and celebrated her life proved how much she was loved and still is. Even in death, Ms. Morrell brought together the school and parish community as they gave support to her family during their time of bereavement. Wherever Ms. Morrell is, Sacred Heart School staff and students are sure that she is enjoying her new, eternal life in heaven. Ms. Morrell, you knew and you did! Article written by Kaileigh, a seventh grade student at Sacred Heart Catholic School, New Smyrna Beach.